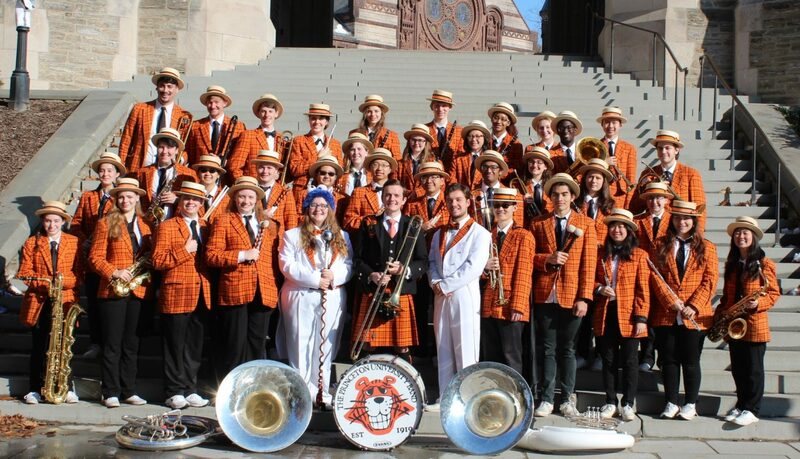 Well folks, it’s been another exciting year for the Princeton University Band full of mayhem, music, marching, mirth, and merriment! Let’s take a look at the highlights from this past year. The year starts off as always with thrilling Dean’s Date Eve and Dean’s Date gigs where the band made its way across campus, into various dining halls and libraries, disturbing the peace aiding stress relief across campus. We gave out candy, okay? And we all know how much students like free food. The Women’s Basketball team crushed the Ivy League yet again and sent the band on a trip to glamorous Bridgeport, Connecticut for the NCAA’s tournament. Unfortunately, it was a heartbreaking 3-point loss to Kansas State, 67-64, but the Band still had a fun time playing in the stands and being on TV. Next year, ladies! In addition, the Fred Fox ’39 Concert was phenomenal as always. Joseph emceed and Sterling conducted a wonderful concert as the Band played seriously for perhaps the only time all year. After Reunions, we all said our tearful goodbyes to our fabulous Seniors and thank them for their hard work and dedication throughout the years. We love you, Class of 2012! Come and visit us! Then, after a well-deserved summer vacation, we were back in full swing for the most exciting season of all: Football! And what a season this was. My previous post has more details, but the Tigers ended up beating both Yale and Harvard in what must have been the most exciting Football game any of us has ever seen, coming back from a 27 point deficit in the 4th quarter. And what does that mean? Bonfire! The Band crushed its way onto a set of stands overlooking the massive flame, and Shirley Tilghman, who had visited us at the Dartmouth game earlier that day, gave us a salute with her Band hat. What an incredible way to end the football season! At the end of the officer year, the DM’s threw a wonderful Bandquet in Prospect House. Even more thrilling costumes emerged than in previous years, but you’ll have to find those pictures on your own. Finally, the new Whitecoats took over and led the Band on a very successful Caroling adventure to spread Holiday spirit. The Libes even made new Holiday Packets! Now that break is coming to a close, you can bet that the Band will be up to even more hijinks in the spring semester. See you back at school in a week and enjoy New Year’s Day!